San Diego County’s homeowners have fared better since the 2007 recession than its renters. In the early 2000s, housing costs skyrocketed and it was easy for people to take out loans, even if they couldn’t pay them back. “People didn’t care what their home payments were. … They would buy any house at any price because if they didn’t, that house will become more expensive,” said Mark Goldman, a real estate lecturer at San Diego State University. 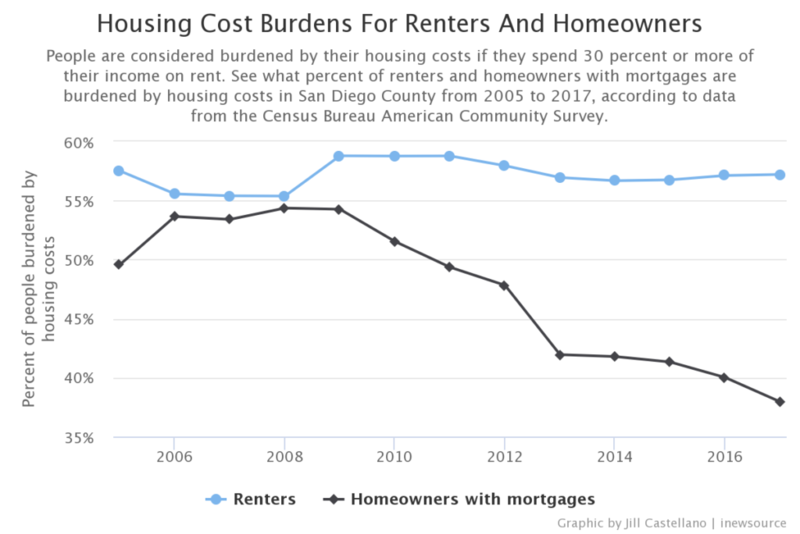 In 2005, 50 percent of the county’s homeowners with mortgages were classified as “burdened” by their housing costs, according to Census data. That changed when the recession came. The Federal Reserve lowered interest rates and home buyers had to prove they had enough income to repay their loans. Housing prices and mortgage rates tumbled. The cost of a 30-year mortgage reached an all-time low in 2012. Homeowners could refinance their mortgages to these lower rates, cutting the amount they needed to spend on housing each month. 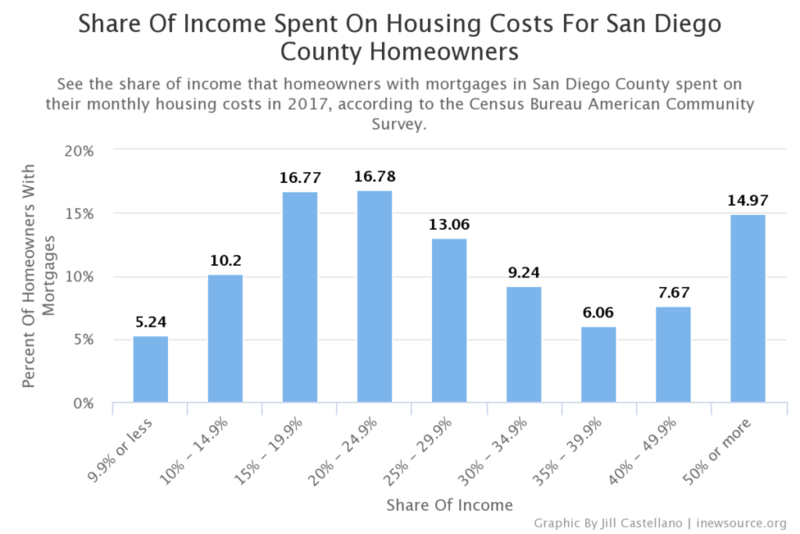 By 2017, the number of San Diego County homeowners burdened by their housing costs dropped to 38 percent. And as homes became cheaper, more people bought them and turned them into rentals. 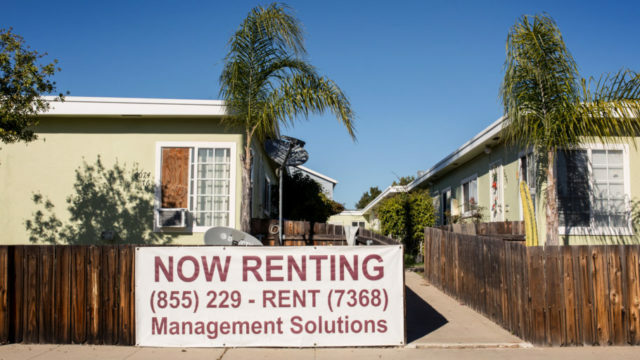 “During the housing bust years, we just saw a surge in the number of renter households that drove rental demand across the country, that pushed up rent and pushed downward rent affordability,” said Aaron Terrazas, senior economist at Zillow. Rent burden is as much of a problem now as it was during the peak of the recession. The number of renters is on the rise, and the cost of renting continues to climb. 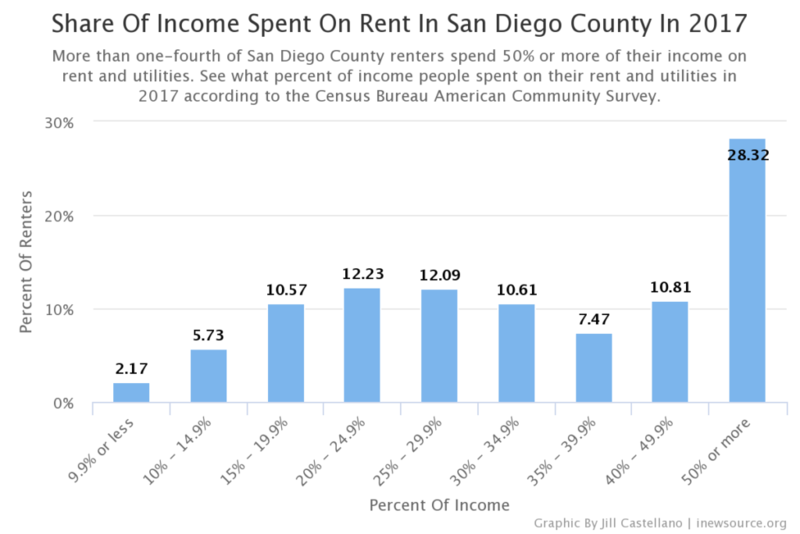 The median gross rent in San Diego County in 2017 was $1,598. Economists point to the housing shortage as the leading cause of high rents in the county and across California. The not-so-easy solution is to build more housing. Incoming California Gov. Gavin Newsom wants developers to build half a million homes every year for the next seven years, more than six times what’s being built now. But San Diego County has been resistant to adding more housing. The county produced 4 percent fewer new housing units in 2017 than it did in 2016. A central piece of San Diego Mayor Kevin Faulconer’s affordable housing plan was put on hold after labor unions and affordable housing advocates spoke out against it. The plan would have encouraged developers to build homes for middle-income families but included families of four with incomes as high as $120,000. In November, Faulconer proposed a plan to let developers build new homes without parking spaces if they are within one-half mile of a transit stop. “I think that the people who were concerned about the cost of housing should be showing up at planning meetings and zoning meetings, and speaking out to encourage higher density and faster approvals to get housing units online,” Goldman from SDSU said.